The central to western region of Argentina behind the Andes is prone to seismic activity, being one of the most active fold-and-thrust belt regions in the world. It was here the country’s worst-ever natural disaster occurred. 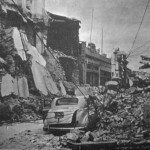 The San Juan earthquake struck one evening in January 1944 the first such occurrence in the area since 1894. It wasn’t the most powerful of earthquakes, with an estimated magnitude of around 7.8 on the Richter scale and an epicenter at La Laja some 30 km (20 mi) north of the eponymous capital of San Juan province. But still the quake killed thousands and inflicted terrible damage on the city and its environs. Much of San Juan was destroyed, with barely one tenth of its buildings withstanding the event and almost all the adobe houses predominating in the city’s residential quarters flattened. In fact, the devastation said more about the poor construction of San Juan’s buildings than the earthquake’s force. One notable casualty was a characteristic 18th-century Jesuit cathedral typical of the city’s charming Spanish colonial architecture, but the destructive quake swept all that away forever. Medical teams and politicians rushed to San Juan – then relatively remote – only to be profoundly shocked by the scale of death and destruction. In the aftermath, moving the city to a safer location was considered. But in the end San Juan rose like a phoenix from its own rubble to become Argentina’s most modern city, with a current population of around 115,000 people. Reconstruction took place using a building code that required all new structures to be quake resistant and imaginative planners specified the wide concentric boulevards, tree-lined avenues, up-to-date housing and green spaces crisscrossed by running water that have given the city a lush Mediterranean atmosphere. Death toll: Estimated at 10,000, one tenth of the area’s population. You should know: The region suffered further earthquakes – in 1952 and 1977 – but thanks to the robust nature of its reconstruction San Juan was not badly affected. Even so, it is estimated that another earthquake of similar magnitude to that of 1944 would still demolish more than a quarter of the city’s buildings. I WAS BORN IN SAN JUAN ARGETINA.MY FATHER MOVED US (MY MOTHER MY SISTER AND MYSELF) TO BA IN THE JUNE OF 1943.IT WAS THE FOLLOWING JANUARY CAME THE GREAT EARTH QUAKE IN SAN JUAN.MY GRAND PARENTS ON BOTH SIDES WERE KILLED.MY FATHER FOUND WORK AS A MECHANIC IN BA AND LATER HIRED AS HEAD OF TRANSPORTATION AT UNZUE.WE WORKED DIRECTLY FOR THE PERONS.AS A YOUNG BOY I CAME TO LOVE THE SENORA.TO ME NOW AS AN OLD MAN I WILL ALWAYS CONSIDER HER AS SOMEONE VERY SPECIAL.WHEN HE DIED ARGENTINA DIED.WE CAME TO THE US AS POLITICAL REFFUGES.I BECAME A CITIZEN SERVING IN THE ARMY FOR A LITTLE UNDER 6 YEARS.AS AN OLD TIME VETERAN I SAY ONE THING.EVA DUARTE DE PERON WAS A GREAT LADY THAT FOUGHT FOR THE POOR AND WORKING CLASS OF ARGENTINA.